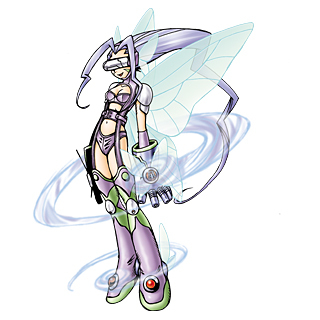 A Digimon that possesses power over Wind which bears the might of one of the legendary Ten Warriors. It freely manipulates the atmosphere to display mirages to its opponents, and specializes in attacks that generate "Kamaitachi" made from vacuums. However, it is more proficient in information warfare than in actual combat ability. Although it has an innocent personality brimming with curiosity, and is a gossipy, talkative troublemaker, because it has no ill will for the person, it isn't really hated. It is thoroughly optimistic, and is the possessor of a strong heart that cuts its way through small difficulties with a smile. Its Special Moves are performing a handstand and unleashing a whirlwind kick (Tornado Gamba), and rushing toward the opponent, then dispatching a back-flip kick after a barrage of kicks (Roseo Temporale). Title: 「風の人闘士」 — "Human Warrior of Wind"
n., From Fairie 「フェアリー Fearī 」, an alternative spelling of fairy, a type of mythical being or legendary creature in European folklore, generally conceived as having a diminutive human form and possessing magical powers with which it intervenes in human affairs. A mythological feminine air spirit in the European hermetic tradition. A type of human-shaped supernatural being in Germanic mythology and folklore. 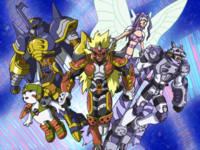 Anime/Manga Digimon Frontier: "The Legendary Warrior! Agnimon of Fire"
3.1.2 Digimon Frontier: Revival of the Ancient Digimon!! 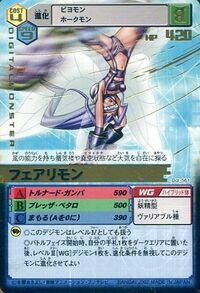 Tornado Gamba  Ita: Tornado Leg(s) トルナード・ガンバ Torunādo Gamba Tempest Twist/Leg Tornado/Gamba Tornado It spins while performing a handstand to kick the enemy. Brezzo Petalo  Ita: Petal Breeze ブレッザ・ペタロ Burezza Petaro Hurricane Wave/Hurricane Gale It produces streams of wind from its fingers and flings them at the enemy. 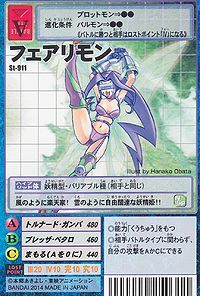 Roseo Temporale  Ita: Rosy Thunderstorm ロゼオ・テンポラーレ Rozeo Temporāre Tornado Kick/Rosy Nightmare It rapidly kicks the enemy, finishing with a backflip kick. Performs two roundhouse kicks in rapid succession. Stomps on the opponent twice while in mid-air. After Astato Vespa, it unleashes a flip kick. Shoots up into the air after jumping. It hits the enemy with its bottom. After being hit, the opponent will fall into confusion. Unleashes a two-step kick on the opponent, then attacks with a somersault kick. Carino Anca  Ita: Pretty Hip カリーノ・アンカ Karīno Anka Love Tap/Wind Strike/Fatal Strike/Destroyer Strike It hits the enemy with its bottom; immobilizing the enemy for a while. Izumi becomes Fairimon when she spirit evolves with the Human Spirit of Wind. Thunder Power Shaking the Ground, Blitzmon! The Five Legendary Warriors VS The New Warrior! Takuya's Fusion Evolution, Aldamon's Explosive Attack! Spirits Become One! Takuya and Kouji's Ultimate Evolution! The Chosen Ones!? 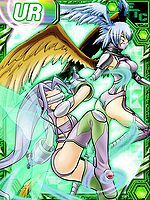 The Children who Manipulate Angemon! 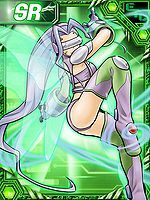 Fight Susanoomon, Lucemon Reaches The Human World!! 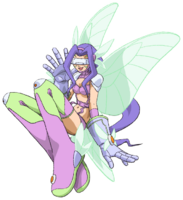 Fairimon is a member of Xros Heart. Xros World!! The Secret of the Two Worlds!? Xros Wars!! Prelude to the End!! Xros Apocalypse!! The Beast of Revelation!! Xros Songs!! To All The Teens Who Are Chasing After Their Dreams!! By using a Spirit of Wind on a Plotmon or Tailmon, it will immediately evolve into Fairimon in the next battle it enters. 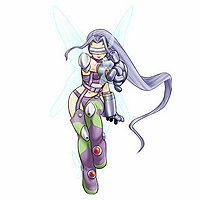 Fairimon is a playable character in this game where it can slide evolve to Shutumon or Ancient Irismon. Fairimon appears as the enemy on the Breezy Plateau level. 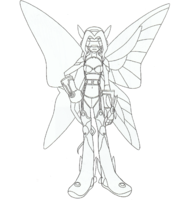 Fairimon's alternate colouration is blue. 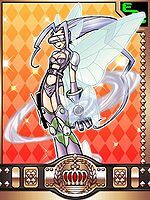 Fairimon is only obtainable as a collectible card. 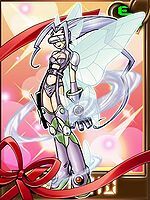 Fairimon is available as a Digimon Medal. A dance of mirages! A warrior of squalls!! Optimistic like the wind! A fairy princess that is free and lively like the clouds!! Manipulating the atmosphere and doing a mirage dance, a striker of the whirlwinds! It floats like a butterfly and eats like a bee! 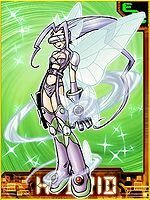 Possessing the power over wind, it is capable of controlling the atmosphere to create mirages and blades of wind. 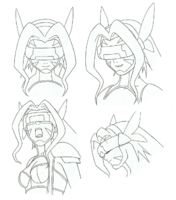 An evolution achieved with the Human Spirit that holds the power of the Warrior Ten of Wind. It is capable of controlling the atmosphere at will, creating mirages or spaces of vacuum. It excels in information gathering. 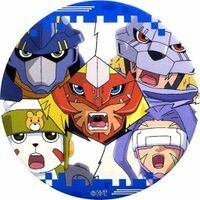 ↑ 9.0 9.1 Digimon Frontier: "My Painful Kick! 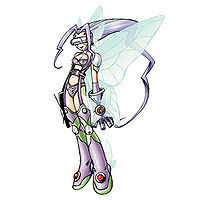 Female Warrior Fairymon"
↑ Digimon Xros Wars: "Xros Songs!! To All The Teens Who Are Chasing After Their Dreams!!" ↑ Digimon Frontier: "Save the Burgermon! 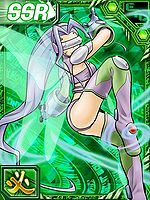 Tomoki's Pure Heart"
↑ Digimon Frontier: "Escape! 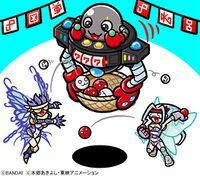 The Phantasmagoric Sephirothmon"
This page was last modified on 18 April 2019, at 10:58.